Instrument programs to sterilize metallic devices sterilization temperature : 134°C, sterilization time : 4 minutes & dry time : 15 minutes. Rubber programs to sterilize rubber & plastic sterilization temperature : 121°C, sterilization time : 20 minutes & dry time : 15 minutes. Liquid programs to sterilize liquid sterilization temperature : 121°C, sterilization time : 20 minutes & dry time : 15 minutes. 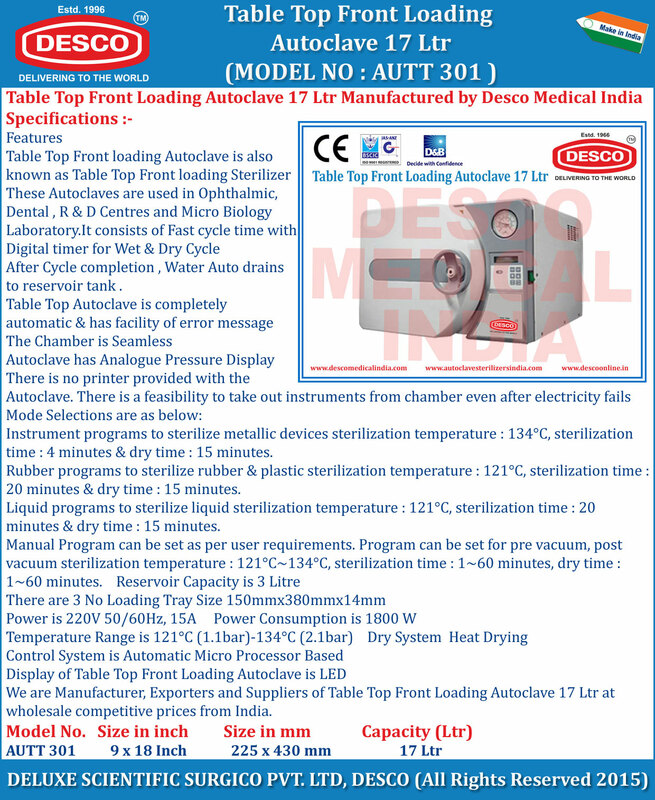 We are Manufacturer, Exporters and Suppliers of Table Top Front Loading Autoclave 17 Ltr at wholesale competitive prices from India.